The beauty of nature, and its natural resources working in harmony, is a goal many strive to achieve. It has been noted that the Earth gives us all me need to serve if we choose to do so. Wahoo’s Adventures took heed and decided to accept the generous offer that the planet has given to many. Solar panels at the New River Outpost. The New River Outpost, owned by Wahoo’s in Todd, NC, is sporting a new wrap-around porch with a new 8.1kW PV solar system. This new system will take the New River Outpost to a zero on the electrical grid. In fact, Wahoo’s will be producing more Kwh than it can use, therefore producing a surplus supply to Blue Ridge Electric grid. Wahoo’s worked closely with local business, being sure to keep as many dollars possible on the dining tables of its neighbors, to make this green initiative possible. Ioncon and Blue Ridge Energy Works, introduced attractive plans to incorporate using the sun’s energy through the solar panel system and yet not disturb any of the nature green space within the New River Outpost Compound. 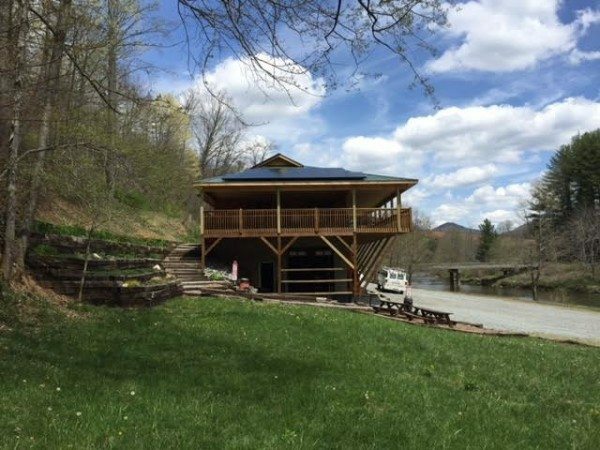 In 2012, Wahoo’s owner, Jeff Stanley’s long awaiting dream became a reality, he built a beautiful, mountain style Outpost for the guest to use, making their experience on the New River more relaxing and all inclusive. The Outpost had a lovely wrap-around porch that overlooked the river. Many guest would retreat to the porch for picnics, or simply to sit and people/nature watch. Seeing the perfect south facing venue for solar panels, a design to cover the wrap-around porch to house the solar panels became the number one possibility. This process made a zero footprint to the property while reducing the Outpost’s electrical footprint to zero as well. Nature has always been generous to Wahoo’s, the residents of the High Country, as well as the visitors to our area. Nature has provided beauty, snow, hiking trails, gardens, and of course rivers to travel, it just seemed that it was time to give back to the planet for all its bounties it has given to all of us. Please feel free to stop by the New River Outpost and see the new solar system. Jeff will be happy to speak with you and be a reference for Ioncon and Blue Ridge Energy Works, helping to connect you with your neighbors to help you make your home or business GO GREEN.